It's A Wallet. It's An Exchange...No. It's Interstellar. Interstellar is a multi-awesome wallet and decentralized exchange. Interstellar takes everything great Stellar has to offer and packages it into one nice coherent user experience tailored just for you. Because we know you are special, and deserve the best. I swear marketing told me to say that :). As a stellar user, I'll try listing some of the features that'll make Interstellar very useful for you. Full control: Full control over your secret keys. This is power. And it comes with great responsibilities. Universal : Interstellar runs on all modern browsers on your mobile, tablet and desktop. Security: Your secret keys are encrypted on your local device with a password only you know about. Your secret keys are never sent to a remote device. Multiple Accounts: This is a biggie. Manage an unlimited number of Stellar accounts simultaneously. You can easily manage your Personal, Family, and/or Business accounts in the same session. Activate Accounts: This is another biggie. Instead of begging Tom or Jerry to give you lumens to fund (activate) your account, you can fully fund your account with either BTC or LTC. After receiving either BTC or LTC, Interstellar will fund your account with 6.5 XLM at market price. When you then trust our BTC or LTC asset, Interstellar will credit you your remaining BTC or LTC. Multisig: This is our biggest biggie. For extra security, we included support for accounts with multiple signatures. Multisig is a great way to protect an account against theft, loss, or death of an account stakeholder. Your business partners or your spouse and you can share an account that requires multiple signatures before any transaction is approved. Sanity checks: Interstellar checks and warns you if you are sending lumens to an exchange without the required memo field. This will help many newbies trying to send lumens to an exchange. UI Deposit & Withdraw: BTC, LTC for now. Segwit support already activated. Fully decentralized: Centralized exchanges have this stronghold belief that you shouldn't be allowed to trade any token you wish. Interstellar is different. With Interstellar, you can trade any Stellar token for any other Stellar token. No limits. No restrictions. Interstellar gives you the full unrestricted power of the Stellar DEX. This means the next big or small Stellar ICO will instantly be available to trade within Interstellar. No permission required. Swap: Don't feel like trading? Use Interstellar's swap feature to swap Stellar tokens in one click. It works just like a decentralized version of Shapeshift. Charts: Beautiful candlesticks and orderbook depth charts for the beginning to intermediate quants amongst us. Not for the super quants . No trading fees: Not now. Not ever. Our very own Robinhood built with Stellar. No inflation tricks: Not now. Not ever. Changes since the last SBC. Ledger Support: We integrated ledger support into Interstellar, with custom bip32 paths. Everything you could do before with Interstellar, you can now do with your Ledger hardware wallet. Given that we initially only supported multiple accounts with secret keys, this required a significant rewrite in many parts of our codebase. New UI/UX: We changed the UI/UX significantly to make it easier to access frequently used features. This includes the addition of an always displayed menu bar at the bottom of the screen that highlights what we consider to be the 5 most frequently used features in Interstellar: (Wallet, Deposits, Withdrawals, Swap and Trade). Improved History: We significantly improved the way we display effects and transactions. More aesthetic, more pertinent info. Trading: We made smoother candlesticks, orderbook depth charts that filter out outliers, and added popular trading pairs for easy asset discovery. Asset Issuers: Auto-discovery, validation, and display of an asset issuer's home-domain. New Anchor Service: This is a huuuge biggie. We completely rewrote our BTC and LTC anchoring service to make it more extendable, scalable and secure. Internal codename, Warp Drive. Why? Because our anchor service was getting used a lot and we had to prepare it for Interstellar travel (usage). I swear, marketing told me to say this too :). Our new anchor service, powered by Warp Drive, is now its own separate service https://cryptoanchor.io. This new anchor service can be used by other wallets. Delete Account: You can now delete any account you added into Interstellar. Lumenaut: We made it super easy to setup lumenaut as your inflation destination. Light/Dark themes: We added a light theme on Interstellar.exchange, for those of us who don't like dark themed apps. But once you go dark, you just can't go back. One last thing: We now have a logo! This changes everything! We also fixed a thousand and one bugs. But we know they are still creeping there somewhere. Your feedback is most welcomed. We'll post updates as they happen. Interstellar. Per Ardua Ad Astra! You can now enjoy the new Interstellar SDEX over at https://interstellar.exchange. 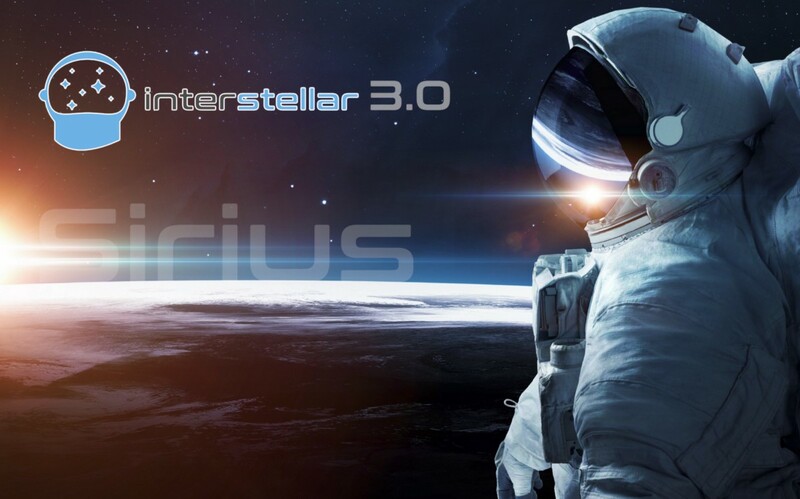 Very excited about our latest Interstellar release: v3.0 (codename: Sirius). TLDR: KYC, fiat anchor integration (USD, GBP, EUR, XAF), new SDEX frontend UI with better trading pair search, market overview, EMA12, EMA26, RSI, MACD. This update, codename Sirius, is only available on modern web browsers for now. Our android and desktop versions will receive this major update soon. Here's a full blog post on what's new and noteworthy on our latest Interstellar release. Introducing the Interstellar v3.0 update codenamed Sirius. Yes, seriously. Sirius is a star system and the brightest star in the Earth’s night sky with a visual apparent magnitude of −1.46.